If we rewind back into time where cowboys and outlaws rule the land and where the general store was the only retail shop in town. When you open the door to the general store you would hear a bell, alerting to the shopkeeper of your presence. Fast forward to today and we still use the same concept as the old shopkeeper and his bell—we just use technology now. American Retail Supply has a selection of Security Entry Alerts that will alert you when customer enter and exit your store from wireless to self-contained alert systems. Security Entry Alerts are great for any retail shop, small or large. Some retail stores that have entry ways facing the sun which can affect the way the entrance motion detector can perform. Wired Entrance Motion Detectors are unaffected by sunlight’s, headlights and reflections. 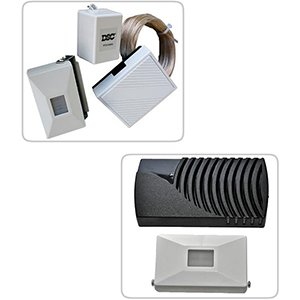 Wired Entrance Motion Detectors are easy to install and to move around, if necessary. Just plug the power supply to the transformer in the back of the store, or where you and other employees can hear it, then place the detector at the front of the store (batteries sold separately). If you need more detectors or power supply units, they are also sold separately, for more information speak with a Product Expert. If you are looking for something with no fuss the Self-Contained Motion Detectors are perfect. Self-Contained Motion Detectors are battery operated and the transmitter and receiver are all in one box. Just place the motion detector at your front entry way and hear every time a customer comes in to shop. Don’t forget to speak with a Product Expert if you have any questions about these products and more.